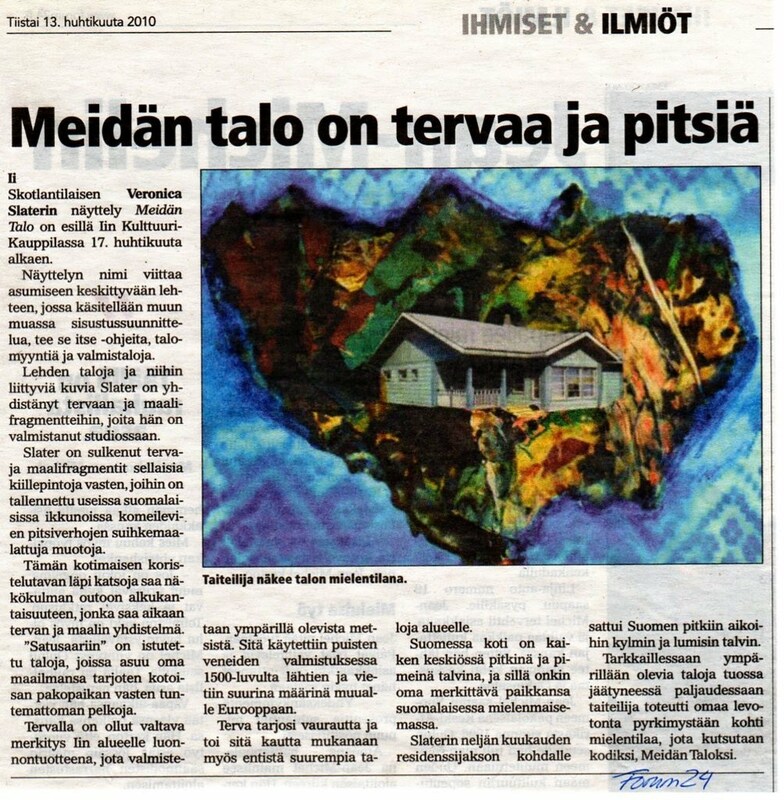 The last two or three weeks have been very busy with putting the show up, showing groups around (including The Head of Finnish Arts Council, Esa Rantanen who was attending Suomen Residenssien Tapaaminen, Osallistujalista – Arts Residency Forum reported by YLE radio). 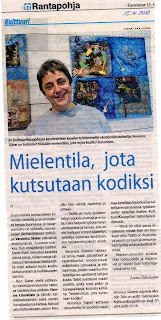 Also had the local newspaper Rantapohja’ come and interview me. 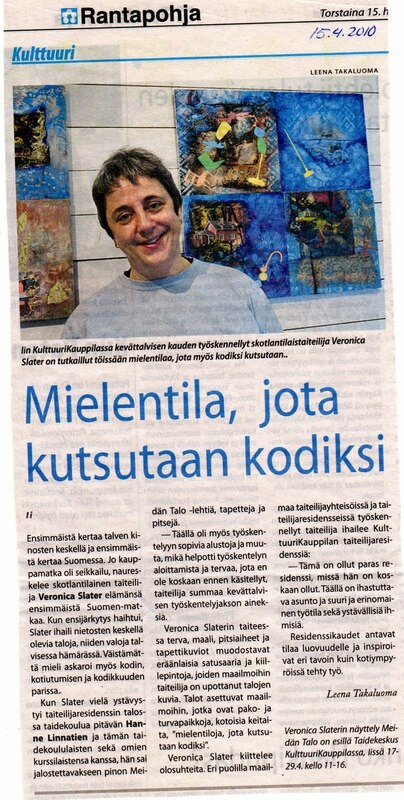 Plus a long interview wiith the magazine Meidan Talo. The exhibition has now been extended to coincide with the May edition of Meidan Talo coming out. For me this feature in Meidan Talo completes the art piece Meidan Talo, as it is where the work began. ‘Full circle’ as a friend Fiona observed. The exhibition opening was great with lots of fizz, flowers, cards and presents – I was very touched. It has all been fantastic and I am very pleased with how it’s gone. The other big event was the 360 seminar Kuvataidepaivat Oulussa about Art and Architecture at Lasaretti Hotelli for Oulu Museum of Art where I gave a talk to a conference of two hundred people. 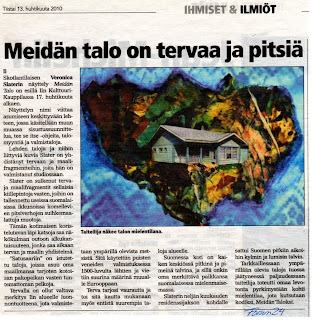 The title of my presentation was ‘Sites of Well Being’ and it was the story of CARAVAN (a previous artwork - see website) and the development of Meidan Talo. The outline of the talk is on the ‘Talks & Courses’ page of this blog. Hard to believe that this is my last posting from KulttuuriKauppila – I leave on Wednesday 28 April and travel to Imatra to give a talk at Saimia and then onto Helsinki for the 1st May weekend celebrations which I’m told are a big thing in Finland – hey a bit of city excitement…! After that on 4 May I give a talk at Verkatehdas in Hameenlinna then the following day I leave Finland – a country I have come to know and love but of course I will be back to visit. It has been a remarkable four months and I will miss everyone at KulttuuriKauppila. Their kindness has made the residency very special and given me a sense of home, here in Ii. All that’s left to say is a BIG thank you to KulttuuriKauppila and to everyone who has supported me including all your comments and emails. Your work looks really bright,vibrant and lacy! We are looking forward to you coming back to Scotland.